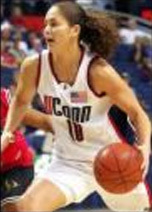 Sue Bird was a Guard for the UConn Huskies from 1998 – 2002. She was UConn’s first ever Number 1 draft pick in the Women’s National Basketball Association to the Seattle Storm. She was recipient of the first annual senior class outstanding senior basketball player in the nation, 2002 Wade Trophy, Associated Press and Naismith Player of the Year, and was a key member of two National Collegiate Athletic Association Championship Teams. These are some of the accomplishments from Sue’s senior year at UConn with many more throughout her college career and beyond. I had the pleasure of meeting Sue while her team was in Connecticut for a game in August 2008. Sue went to Christ of King High School in New York which is known for great basketball teams. “My senior year five of us went to Division I colleges.” During her senior year her team won the state championship, the national title, finished ranked first in the country, and went undefeated. That year personally, Sue was the New York City and New York State Player of the Year, and the New York Daily News Player of the Year. Sue’s high school and AAU program had a lot of experience with basketball former standouts for example Chamique Holdsclaw. The programs were run by the same person; with his experience he was able to provide much assistance to Sue during her college selection process. She was given time frames of when to have her college list narrowed to ten, then to five then her top three. Regarding her memories at UConn Sue said, “There are just way too many to choose from on and off the court.” Basketball wise she’s proud of the championships and holding up the trophies was very memorable. The heartache of losing to the pleasure of winning. “I think that’s why we were able to be so successful. We got along so well, we were able to translate that on to the court.” Although Sue didn’t elaborate on her personal accomplishments, to name a few, she was one of only two players (Jen Rizzotti) at UConn to score over 1,000 points, 500 assists and 200 steals. She ranks number 2 in assists with 585, number 1 in three point field goal percentage (45.9), won two National Championships, three Big East Championships and Big East regular season titles. The WNBA draft day came. 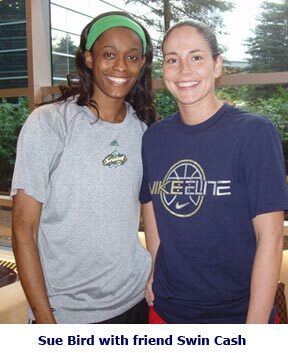 “It was fun but the best part of draft day was that all four of us Tamika Williams, Asjha Jones, Swin Cash and I were there together to start something new and it was also sad because it marked the end of our time together.” For Sue, she was selected number 1 to the Seattle Storm. It was somewhat alarming to her because Seattle is about as far away as you can be from UConn and New York where she grew up. Sue remembered her first press conference. The Seattle Storm public relations person was preparing her for a lot of media people, many questions, and how not to be overwhelmed. When Sue arrived to meet them it was four people, nothing compared to 10-15 reporters and 3-4 television cameras on a regular basis at Connecticut games. During the WNBA off season, Sue has been spending her time playing in Russia for the past six years. Once you get beyond the language barrier and get used to a different culture, you learn to appreciate living in another country. Sue has again enjoyed success in Europe winning the Euro League and Russian Super League Titles. With any spare time above and beyond all of Sue’s basketball obligations and commitments, she tries to be as involved in community work and basketball camps as time permits. Sue isn’t able to see many of the UConn games while she plays in Europe but believes that with the experience of being at the NCAA Final Four last season, although they lost great players with graduating seniors Charde Houston, Mel Thomas, Ketia Swanier and Brittany Hunter, they still have a team we can expect a lot of great things from.